Kieli is one of those hauntingly pretty girls whose special blood and pure heart allow her to see things unnoticed by others. Harvey is one of those chiseled copper-haired boys who is seventeen and has been seventeen for a long time. When their paths cross seemingly at random, Harvey finds himself charmed by Kieli, and Kieli finds herself dazzled by Harvey… Stop me if you’ve heard this story before. The next morning, when Kieli opened her eyes she was lying on a sofa with broken springs in the waiting room, wrapped in her coat and a dusty old blanket. The clinic had completely fallen to ruin. Yellow sand and dust had settled below the crisp, clear, cold morning air, and the once clean, white paint on the walls had faded to yellow and peeled off in places, showing the concrete wall underneath. Kieli spent a while walking through the deserted house, looking for Harvey, the floor creaking with every step she made. When she went up to the second floor, the plants that decorated the balcony had withered to nothing, and only the cracked pots remained under the nebulous morning light. Everything in Kieli’s world is slowly falling apart. Isolated cities are separated by vast stretches of desert, small villages that serve as way stations along the side of railway lines are slowly shrinking in population, and the wasteland outside habited areas is still littered with the detritus for a war over natural resources that petered out a hundred years ago. Kieli is strangely suited to life in this world, as she possess the unusual ability to see and interact with the ghosts of the dead, who are seemingly more numerous than actual living people. Through the mischief of her dead roommate, Kieli encounters Harvey, who used to be a soldier in the war. Harvey is a creation known an as Undying, a class of artificial beings powered by mechanical cores of pure energy. Aside from his bad attitude, Harvey seems mostly harmless until he unwittingly drags Kieli into a conspiracy concerning the Church that governs Kieli’s world. The two are accompanied by the ghost of an older man known as the Corporal, who resides in the shell of an old radio and provides both insight and comic relief. In an environment where everything is dead or dying, Kieli and Harvey shine brightly as they find adventure and new life in each other’s company. Since Kieli is a light novel, it receives the full graphic treatment, with eight full-color anime-style illustrations at the front of the book and a number of black-and-white illustrations scattered throughout the book’s chapters. The tropes of the novel are not specific to Japanese popular media, and they should appeal to a wider audience for young adult fiction. 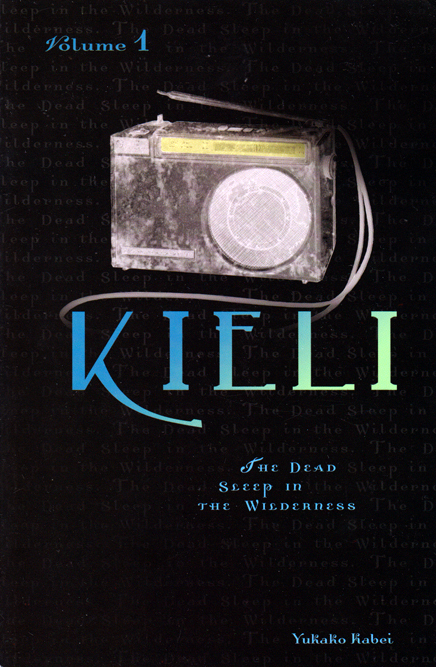 Kieli is an orphan who lives in a boarding school, where she is misunderstood and unappreciated by her peers. Harvey is an angsty, brooding badass who has a soft side that he keeps hidden in order to survive in a harsh world. The spirit of the Corporal residing in Harvey’s radio is a grumpy old man who cheerfully dispenses humorous complaints. The Church is mysterious and sinister, and its agents are genuinely frightening. A shortcoming of many light novels published in translation is that their language is more manga-like than literature-like, by which I mean that its primary purpose is to shoot the reader forward as quickly as possible through a series of increasingly improbable events. Kieli occasionally suffers from this style of narration, but it usually allows the reader time to linger over events and absorb the story’s atmosphere. The translation of Kabei’s prose is lucid and engaging, inviting the reader to enter Kieli’s world without fussing over translation notes and awkwardly translated dialog. Occasionally a character will bow to another character, but the novel otherwise has very little “cultural odor.” Because of the quality of the translation, I found myself reading not just for the story but also for the pleasure of reading such straightforward and well edited language. I also feel the same way about the translation of the Spice and Wolf light novels, and I can’t help but offer my most profound thanks to the editorial staff at Yen Press for doing such an excellent job with their releases. Kieli ends with a bit of a cliffhanger, but its sequels have already been published by Yen Press, which seems to be keeping up a steady release schedule. I don’t know why I waited so long to start reading this series, because it’s really quite good. I can’t wait to read the next volume! When I read your review, I said to myself, “Odd, is it that “pure love” literature is making a crypto come-back through light-novels?”. Then, I checked on the date of release – 2003 – and I realised that I had improperly assumed it was a new book. In fact, it just sounds like typical “pure love” (Ima, Ai ni Yukimasu, from Takuji Ichikawa, being perhaps the most famous taishû bungaku example), and the publishing date definitely matches! I have been curious: would you personally deem it relevant to extend a such a literary concept to a light-novel? Or would you consider “pure love” a pop-culture phenomenon, and thus apply it to entertainment as a whole?